The trick to getting scones right is to be quite quick about making them. Don't handle the mixture any more than you have to, and don't add lots of flour when you're rolling it out. Also, remember that the baking powder will take effect as soon as you have added the liquid - the scones should be moved into the oven as soon as possible so that the raising agent can work its magic. Other than that, scones are a very simple way to fill your home with that wonderfully toasty, buttery baking smell. Preheat the oven to 220°C, gas mark 7. Lightly grease a baking sheet and dust it with a little flour. Measure the flour, baking powder and butter into a mixing bowl with a pinch of salt. Stir in the cubes of butter until they are coated with flour, then start rubbing them in with your fingertips until the mixture begins to resemble wet sand. Alternatively, if you have a food processor, you can put the flour, baking powder, butter and salt in the bowl and pulse the mixture (blitzing might overwork it) until it has reached the right consistency. Next, measure out half the milk into a jug. Keep some of the milk to one side at this stage because you might not need all of it. Break the egg into the jug, then whisk it lightly with a fork. This way you can make sure that you get all the egg in, without having to use all the milk. Take a blunt knife and use it to distribute the sugar through the flour and butter. Pour the milk and egg mix over and stir it in. Measure out the remaining milk and start adding it gradually, continuing to mix until the dough comes together. It needs to be a soft dough, but not so wet that it is too sticky to pick up. Lightly dust the work surface and your rolling pin with flour. Scoop the dough out onto the work surface, shape into a circle and gently roll it out until it is 2cm thick. It's advisable to use a ruler at this point. Don't be fooled into thinking that you can estimate this measurement accurately; the dough is usually a lot thinner than you think it is. Tip a pile of flour out onto the work surface and dip your cutter in it to stop it sticking to the dough, then stamp out five rounds of 6cm, dipping the cutter in the flour after each one is stamped out. For perfectly even tops, do this with a sharp push rather than giving the cutter a twist. For quirky, lopsided scones which have a certain charm of thier own, twist the cutter as you stamp them out. Gently knead together the scraps of pastry and roll it out again - you should be able to get another two scones out of the dough by re-rolling it. Transfer the scones to the prepared baking sheet and brush the tops with milk for a glazed finish, or dust with flour for a more matt look. Bake for 13-15 minutes until golden brown and risen. You can test to see if they are cooked through by tapping them on top - if they are, they'll sound hollow. Transfer the scones to a wire rack to cool. Leave them as they are to develop a crusty top, or cover them up with a tea towel and they will soften in their own steam. 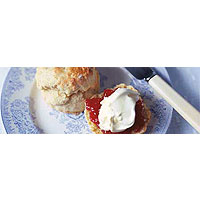 Serve them warm from the oven with a spoonful or two of soft, set strawberry jam (you could also use raspberry) and a generous dollop of clotted cream. And, of course, don't forget the tea.